Cuba is a fascinating and unique country, with enough diversity to please all types of travellers. History buffs will feel as though time has stood still in Cuba’s charming colonial towns, rich with colour and culture. 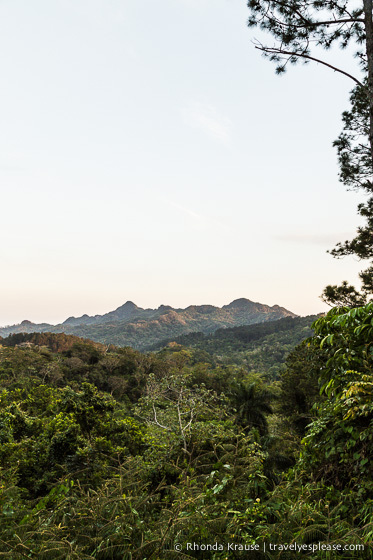 Nature lovers and adventure seekers will enjoy hiking among the jungle covered mountains and lush valleys. Those looking for a little excitement will find it in Havana, Cuba’s lively capital city. If all you want is a little R&R, then Cuba’s sandy beaches and azure waters are the perfect place to spend your days. Even though Cuba has a lot to offer, at times it can be a little overwhelming and confusing if you don’t know what to expect. In many ways, it’s like stepping into a bygone era. Classic cars from the 1950’s cruise the streets, past a mix of meticulously restored buildings and crumbling colonial charm. To ensure an enjoyable vacation, there are some things you should be aware of before you embark on your first trip to Cuba. We put together this first time visitor’s guide to help ease the minds of travellers planning their first trip to Cuba. Some of the points are small, specific things you may be wondering about, others are more general, helpful tips. (This is based on our personal experiences, so keep in mind that things may vary between regions in Cuba). To enter Cuba, you must have a valid passport, valid health insurance (not issued by a U.S. insurance company) and a return ticket. We were prepared to show proof of our health insurance, but weren’t asked for it. Still, make sure you bring documentation just in case. A tourist card/visa is required for all travellers. These can be obtained from the airline or travel agency which you bought your trip from, or a Cuban consulate/embassy. We were given our tourist cards on the plane. Don’t lose your tourist card as you will need this to exit the country. At the customs desk, I was surprised to see that we had to have our picture taken. Your bags will also be put through the x-ray machine again. You will have to declare the value of goods you are bringing into the country. This includes things like camera equipment, laptops and other electronics. This form was given to us on the airplane. You only have to declare the amount of cash you are travelling with if it’s over $5,000. It’s worth noting that GPS systems cannot be brought into the country. The official language is Spanish. English is fairly widely spoken in Havana and in the large hotels and resorts. Cuba operates on a dual currency system. Visitors will use the convertible peso (CUC), while locals use the peso cubano (CUP), also called moneda nacional. You will have to convert your money upon arrival as Cuba’s currency is not internationally traded. Most hotels will be able to change your money at the front desk. Visa & MasterCard are accepted by the majority of hotels and some restaurants. In small towns, cash will be needed. Credit cards must be issued by non-US banks for them to be accepted. There are ATMs in the bigger cities, but we didn’t make use of them. The current is generally 110 volts, same as North America, but some hotels and modern buildings have outlets that are also 220 volts. Read the information on the outlets and plug into whichever voltage you need. Electrical outlets take 2 flat blades, perfect for North American appliances. For European appliances with round pins, you will need an adaptor plug and possibly a voltage converter, depending on your hotel. Due to fuel saving programs, it’s common for the electricity to be shut off periodically. We really noticed this in Havana. Most hotels and resorts have their own generators though, so outages don’t affect them. Cuba offers many different choices when it comes to accommodations. All inclusive resorts are the most popular choice for tourists. They are a little older and smaller compared to what we saw in Mexico, but still very nice. Other options are modern luxury hotels with pools, colonial hotels in the centre of town, and room rentals in private homes (casas particulares). Bring your own wash cloths because these are not supplied by the hotels and resorts. It is customary to leave a tip at the end of your stay. The amount is up to you, but remember that a tip in convertible pesos could equal an entire month’s wages in Cuban pesos. Gifts such as toothpaste, deodorant, candies and crayons for the children are also appreciated. Most hotels have computers you can access the internet on, but it’s very expensive and unreliable. We bought an hour of WiFi in Havana which timed out more than it worked. I’m not even kidding when I say it took almost an entire hour to send two emails. The best way to get around Havana is by taxi. Havana is a big city and the districts are quite large and spread out. The official taxi company is called Cubataxi. Cabs are readily available and they can be hailed in the street or found at hotels and the main plazas around town. It’s the most fun to ride in a classic American car, which are also official taxis. Just make sure they have a TAXI sign in the window. To get around Cuba, there are modern coach buses that tourists can use. Viazul is the national bus company designed for this purpose. They connect Havana with Santiago and provide transportation to the main cities, towns and resorts in Cuba. If you venture out of Havana and Varadero, you will see a lot of people hitchhiking. This is how the locals get to work, run their errands and travel between towns. It is common for Cubans to pick up local hitchhikers, but if they offer tourists a ride, they need to have a permit or they can be fined by police. If you rented a car in Cuba, I’d refrain from picking up any hitchhikers. The roads in Cuba were in decent condition, at least where we went. In the small towns it’s common to come across slow moving horse and wagons. In the countryside you need to watch out for animals grazing on the side of the road. Be alert at railway crossings because they don’t have gates. In the cities, watch out for cyclists and be careful when driving down unlit roads. Driving between Havana and Varadero. We found the food in Cuba was not as bad as everyone says it is. It was good, maybe a little bland at times, but by no means terrible. Don’t go expecting spicy food, like in Mexico, because you won’t find that in Cuba. Rice and beans are staples in traditional Cuban cooking. Meat-based and seafood dishes are common. You’ll also have no trouble finding international dishes like pasta. We loved that live music is often performed in restaurants, at all times of day. What we didn’t really like, was how they would come to our table while we were eating and ask us to buy their CD. In Havana, we found many nice restaurants in well-restored colonial buildings, which usually are built around a pretty garden. In most restaurants outside of the large hotels, be prepared to pay in cash. If your bill does not include a tip, add a few convertible pesos to show your appreciation. Sweets and snack foods, like chocolate and chips, are very difficult to find so I recommend you bring your own. I barely survived after my supply of chocolate ran out! Public washrooms are hard to find and often without running water. There usually is someone there who will pour a bucket of water in the toilet after you exit the stall. I recommend carrying a small bottle of hand sanitizer. Toilet paper is limited. If there is some, you usually will have to give a small amount of change in exchange for a few pieces of subpar toilet paper. I brought a few rolls from home and always carried some with me. We found Cuba to be quite safe, but just like anywhere else you need to be alert and use your common sense. Incidents of petty crime do occur, so it’s wise to leave your valuables at home or in the hotel safe. Don’t wear flashy jewelry or carry large amounts of cash and keep an eye on your camera. There are security cameras on the streets in Havana and the police are never very far away. In the popular tourist areas, like Old Havana, you will see policemen in dark blue uniforms. Their main responsibility is to protect tourists from pickpockets and scammers. Cubans are very friendly people, but you may come across a few that will try and hustle you, especially in Havana. Called jineteros (jineteras, if female), these individuals will try and initiate a friendship with tourists, only to make money off them. They may sell you counterfeit goods (especially cigars) or take you to a restaurant or room for rent where they earn a commission from the owners. Cuban authorities are trying to put a stop to this with tough penalties for Cubans caught engaging in this behaviour. Another common hustle in Havana, one that we had happen to us, is the so called “milk scam”. This is where a local will befriend you and then ask you to buy milk for their baby/children. If you decide to buy them milk, it shouldn’t cost you more than 5.75 CUC for one bag of powdered milk. There is a scam that’s run near the Capitolio, which is to take tourists to a store and charge them 20 CUC for one bag of milk. When receiving change for your purchases, double check that it is in CUC and not Cuban pesos (CUP). We had a cab driver give us back our change in CUP instead of the CUC we paid in. He was not happy when we called him on it! In Cuba, the locals do not have easy access to many basic personal hygiene items such as toothpaste, deodorant and tampons. These items are not readily available in stores for some reason, and if they are, are very expensive for the locals to buy. In Havana especially, people will approach you asking for these things. We carried around travel sized toiletry items to give away. Havana was the only place we went in Cuba where people asked us for gifts. One of our guides told us that Cubans do appreciate being given small gifts, but she recommended we give to those people who are not asking. There is an exit tax of 25 CUC that must be paid in cash at the airport. We set aside this amount as soon as we arrived so we wouldn’t spend all our money! UPDATE: Since May 1, 2015 the Cuban Departure Tax will no longer be paid at destination. It should be included in the price of your trip when buying a flight or vacation package to Cuba. Check with you travel agent, carrier or tour operator. Cuba is a beautiful, intriguing, and spirited country, unlike anywhere I’ve been before. Visit with an open mind and open heart and you will surely have a great time on your first trip to Cuba! Purchases made through these links earn us a small commission, at no extra cost to you, and help support this website.